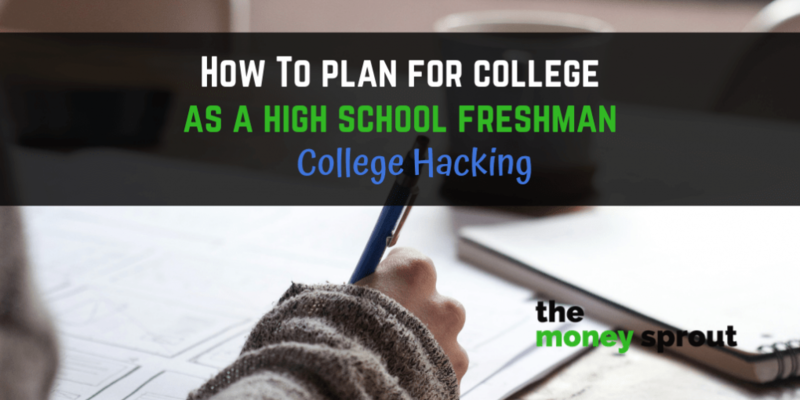 Just over a month ago, I wrote a post discussing the steps our oldest son was taking to hack college as a high school freshman. Actually, it isn’t just him taking these steps … but rather my wife and I helping him down this path. Note – We have two 529 plans setup to help all 3 of our children cover some of the costs of college. We haven’t invested any new money into these accounts for over 3 years. Each of those steps are just a few of the college hacking tools we are using to hopefully put together a plan to pay for college. Our goal is to have each of our 3 children get a 4-year degree with zero debt. That is no debt for our children and no debt for my wife and I. Today I would like to give a recap of our plan … after he has finished his first semester of high school. We are entering our next planning phase of our college hacking roadmap. I want my kids to enjoy their youth and have fun. My wife and I don’t want to stress them out over their grades and homework and push them to do things they don’t want to do. However, we have also made it clear the importance of a college education for their future … as long as it makes sense and is carefully planned. There is no reason to have them get a degree from a university where they couldn’t find a job. It is even worse if they get that degree and rack up a ton of debt along the way. Over the past year, we started to put together a plan (that is constantly being modified) to help get our oldest son into college … and to eventually graduate debt free. After his first semester as a high school freshman, we have checked some boxes off on this plan and are starting to add additional steps for the remainder of the year. I really don’t want to be the parent that brags about their kids grades. Personally, I don’t think an awesome grade point average means all that much when it comes to surviving in life. But my wife and I do see the value of a good grade point average in terms of getting into a college and possibly helping to get scholarships. We’ve told our kids that as long as they give 100% effort in their studies … we are fine with their grades. My son took a moderately heavy class-load his freshman year. During the first semester, he took one AP course, an honors course, one elective, and Spanish II. After a lot of hard work and figuring out how to manage his time … he received an ‘A’ letter grade in every class. The expectations are not to get an ‘A’ in every class in high school … but to work hard at school and focus on managing his time. He did great in both his first semester and the results took care of themselves. He is now motivated to continue working hard which is awesome. Lately we have been having conversations with our son about things he is interested in and may want to study in college one day. We don’t expect him to know what he wants to study or the type of job he wants as a 15 year old. Heck … I changed my major 3 different times and attended two different University’s to get my undergraduate degree. Really we just want him to start thinking a little bit about his future and his passions and interest. He started browsing some of the University websites in our state to get an idea of the different types of campuses around. We have no idea where he wants to go right now … and probably won’t for a couple more years. But we are at least starting to collect some information about these schools to help make future decisions. Our son will take the AP World History exam this coming May. Depending on his score and which college he decides to attend … he may receive college credit for this class. He is only allowed to take one AP course as a high school freshman … which is probably a good idea based on the workload. But as a sophomore he can take more AP courses. So we are mapping out a plan on which (if any) AP courses and honors courses make sense. For example, he has absolutely no interest in Psychology. So taking AP Psychology is probably a waste of time and effort. But there are other AP courses that could make more sense for him to take like AP Chemistry. Not only are we planning out his AP courses but also thinking about his junior and senior years. As of now … he plans to take dual enrollment classes starting as a junior at the local community college. 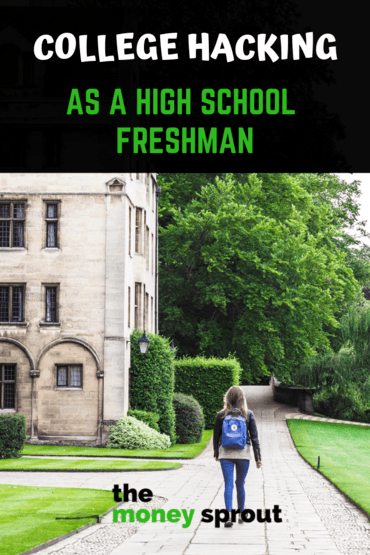 It is a bit early to start applying for college scholarships as a high school freshman … although his school suggests 9th graders start looking. So for now, we are exploring the different options of where to apply for scholarships and the types that are available. Based on our income … we don’t expect to get much in any aid based scholarships. However, there are possibly some changes to get merit based scholarships … so that is where our focus will be over the next year. Starting to map out any potential scholarships that could help pay for a portion of college one day. We want our kids to get a good balance of school and work … as well as play before going off to college. One of our goals over the next year is for our oldest son to start working. Whether it be for pay, volunteering, or both … we feel this is an important life lesson. Learning how to balance school, work, sports, and relationships now can help teach our son the importance of time management. I think this is one of the best life lessons that we can help to teach our kids as the enter adulthood. Every couple months or so it seems like our roadmap for hacking college changes or something is added. It is a work in progress and we are learning new things all the time. We know that paying for college won’t all come from one source or some magic full ride scholarship. That is why we have taken steps and have added different tools that will help us all get to our goal one day. We plan to continue providing updates on our progress for tools that are working and those that may not. Not only are we building our roadmap for our high school freshman … but we have two younger kids that hope to follow a similar path one day soon. Taking AP Courses in High School – Are They Worth the Fuss?